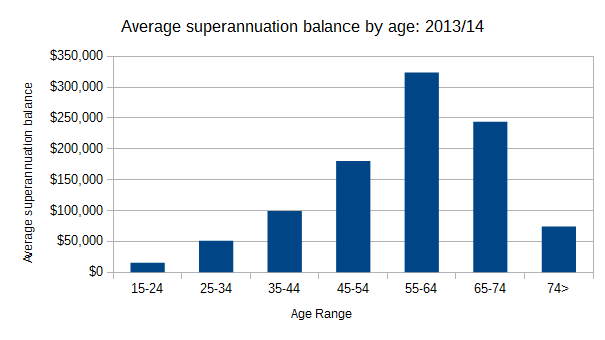 The average superannuation balance by age is between $15,600 and $74,100, peaking at 323,700 for people aged 55-64. However there is considerable differences in average superannuation balances based on gender, as a different set of ABS statistics shows. Note that these statistics use slightly different age brackets. The ABS statistics also showed that the average superannuation balance across all ages was higher than previously thought, with the average superannuation balance for ‘all households of $159,900 in 2013/14. 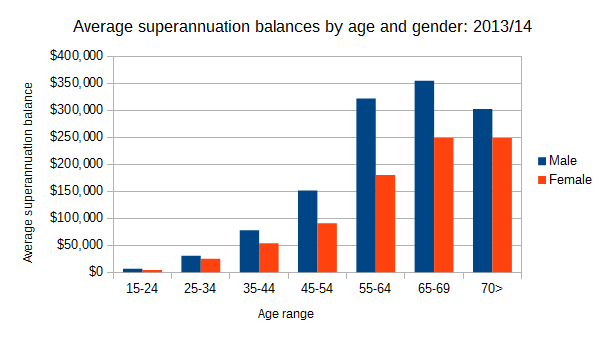 There are also indications the superannuation gender gap is slowly closing. According to the most recent ATO SMSF statistics the average balance per Self Managed Superannuation Fund (SMSF) member for the 2013/14 financial year was $564,086. I am a little bit confused by the numbers presented in this as the average super balance by age for the 25-34 age bracket is $51100 however the average breakdown for the same age bracket by gender is $30760 and $25015 for men and women respectively. This means that the average super is effectively doubled when not split by gender? You raise an interesting point. I don’t know the reason for this at the moment – I will need to look into it. If your interested the data comes from table 12.2 in 6523.0 Household Income and Wealth, Australia, 2013-14 and table 25 in 4125.0 Gender Indicators, Australia, Aug 2015. The age and gender data (from ABS 4125.0) was released in 2015, but includes figures for superannuation up to the 2013/14 financial year. Geoff, you are exactly and completely correct. As far as Super goes we have three groups to consider and not just two. We have Single Males, Single females and Couples. Super and the Super and the Aged Pension go hand in hand and unless we have that third column then the stats become rather academic having have little purpose in the real world. I am tempted to say that the average male at 65 has $355,000 and the average female at 65 has $250,000 meaning that a couple at 65 has $615,000 cash assets in Super … which is highly relevant when you factor in the Aged Pension entitlements. I suspect that my assumption from the above stats is wrong. Averages bssed on the “mean” are totally skewed by the Rineharts and Packers. Please use “median” figures that are factually representative. Averages are near meaningless. Totally inflated by the Murdochs and packers. Why don’t you use means ? statistically a better measure. The above figures are the means. I’m using means/averages instead of the median because that’s what the Australian Bureau of Statistics reports. Though median figures are include for some aspects of the reports – I’ll need to incorporate this into an update of the article. You can use means, medians or whatever you want but consider this: the average for all Australians for 74+ is $74,100 but the average for males is $302,309 and for females $248,619. This is not possible in any configuration. What a farce! It makes the expression that there lies, damned lies and then statistics an absolute truism. One would expect that the male average would be above the overall average and the female below it. but both massively over it. You have to be kidding! Yes, my thought exactly. These stats are an embarrassment! Patricia you are making a basic error that the super balance is meant to be retained till death. A more accurate way of looking at it may be to consider a retiree with a super balance of $800,000. If they have a life expectancy of 16 years they could withdraw $50,000 a year until death, assuming absolutely zero growth on their investment. Super was never intended to be an asset that was passed on to children, it is meant to provide an income during retirement and to be progressively drawn down each year. LOL Dennis, a couple at 65 with their own home with $800,000 in Super at 5% withdrawal would be paid $50,000/yr while the couple next door, who have never worked and are of the same age living in their inherited home would be able to claim the Aged Pension of $35,000 and with pensioner benefits and the health card their income would effectively be $40,000/yr. I can now see the benefits of saving that $800,000 in Super over one’s working life to get an extra $10,000/yr income over a couple who have a Nil Super Balance. Of course that extra $10,000 has to cover extra costs as the ‘rich couple’ do not get any pensioner discounts. I can now see the retirement benefits of Super cash savings. Patricia, see my comment below if it is published. You are a bit out your stats but your message is clear. Like have up updated this article since January 2016?